It can be difficult to find a good gift that’s affordable, thoughtful, and unique. I know that find it really hard to strike the right balance, and there are so many options out there that it can get downright overwhelming. I had gotten to the point where I feel like it’s all “been there, done that” and gift-giving felt a little more like a ritual than a heartfelt offering. But recently I’ve been inspired, and am looking forward to giving gifts for every occasion!!! Why the change? 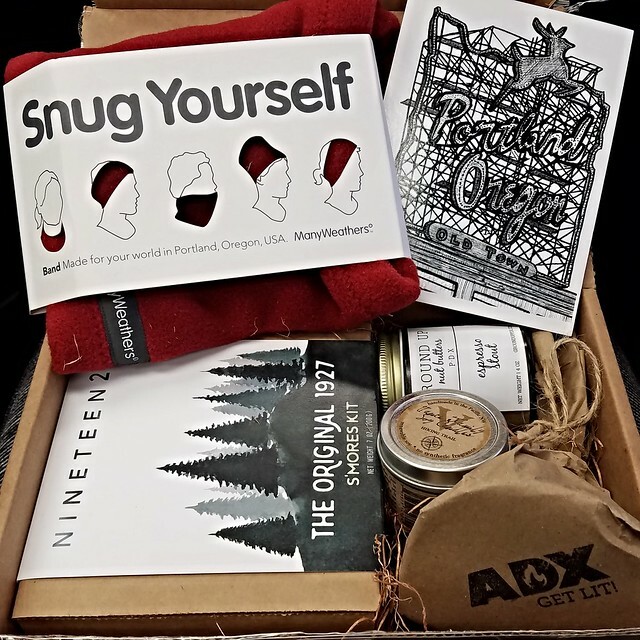 Well, I received a giftbox from With Love, From PDX to review on Run Oregon, and I LOVED it. It’s exactly the kind of gift I like to give–personal, practical, and a little bit quirky. And it’s easy-peasy! (That part can be our little secret). Foraging for locally-sourced, handmade goods to curate beautiful gifts for everyday occasions. Life is full of opportunity to show your gratitude and love. A bit of our everyday inspiration… Inger McDowell-Hartye is the curator behind With Love, From PDX. She’s combined both her passion for community and locally-made goods to grow With Love, From PDX into a successful company. Launched in 2015, our company curates gift collections with some of our city’s most adored brands. With Love, From Portland gift box. Photo by Marilyn Tycer. S’mores Kit from Nineteen27 S’mores ($16.50). It includes supplies to make four delectable s’mores–gourmet graham crackers, vanilla marshmallows made from scratch, and dark chocolate squares from Missionary Chocolates, one of my FAVORITE local chocolatiers (FYI, roasting sticks not included). This kit takes your favorite childhood campfire dessert and elevates it to a new level. Perfect for kids, and kids-at-heart. Espresso Stout Nut Butter from Ground Up Nut Butters PDX (4oz for $8). How much more PORTLAND can you get this little jar of goodness? I guess you could throw some pine needles in there, but that wouldn’t taste very good. I may have eaten a spoonful or two just straight out of the jar. Firestarters made at ADX. I don’t have a fireplace so I re-gifted these to a friend who does, and she said they did the job. But what’s really fascinating is ADX, a 14,000 sq ft “hub for collaboration where individuals and organizations make and learn.” The space includes a woodshop, metal shop, and digital design lab, and is open to makers of all kinds. Snug Yourself buff/band by Manyweathers. This versatile fleece buff can be worn several different ways and is a staple for any PNW outdoorsperson. “Hiking Trail” scented candle from Vance Family Soy Candles. This handcrafted, GMO-free soy candle is naturally scented with a mixture of essential oils that evoke earthiness, fir, and cedar. What I love most about this Vancouver, WA based company is that they donate at least 10% of their profits to local charities. I can’t wait to try some of their other 50+ scents! You can curate your very own box of goodies on the With Love, From PDX website. They currently have an array of products that includes local honey, notebooks, boysenberry jam, trail mix, hot sauce, soap, salt, printed tea towels, lip balm, chocolate, potato chips, tea, and more. Prior gift box options included socks, bitters, mugs, cutting boards, caramel corn, wood coasters, jewelry, cookies, shrub, spiced nuts, beard oil, Their website is truly a treasure trove of gift ideas that could work for birthdays, anniversaries, corporate events, thank you’s, hostess gifts, or just because. In addition to gift baskets and coffee subscriptions, With Love, From PDX hosts a fun variety of rotating workshops taught by local makers and artists. Past offerings have included workshops on DIY mixology cocktails, melt & pour soapmaking, natural deodorant & lip balm making, candle making, flower arranging, terrarium making, calligraphy, wood burning, and others. There’s a ton of awesomeness to choose from, and you can’t really go wrong with any of the options. So go ahead and pick out a killer present, pat yourself on the back for a job well done, and then maybe treat yo self to a gift as well.